Sometimes the best Christmas presents are the ones we give ourselves. So this year I bought myself a new cookbook. I nearly swooned over the promise of full page, full color photographs of every recipe, majority vegetarian recipes, and a casual style of writing from a self-taught cook not too different from myself. This describes Deb Perelman’s The Smitten Kitchen Cookbook. Does Smitten Kitchen sound familiar? It should. If it doesn’t, then march yourself over to smittenkitchen.com (and then come back!) to check out for yourself the masterpieces Deb comes up with in her tiny New York apartment kitchen. Ever since it arrived I have been itching for an excuse to try out one of her recipes. My opportunity came soon enough, as the husband told me his brother was coming down to visit while his sister was also in town. Bingo–dinner party! 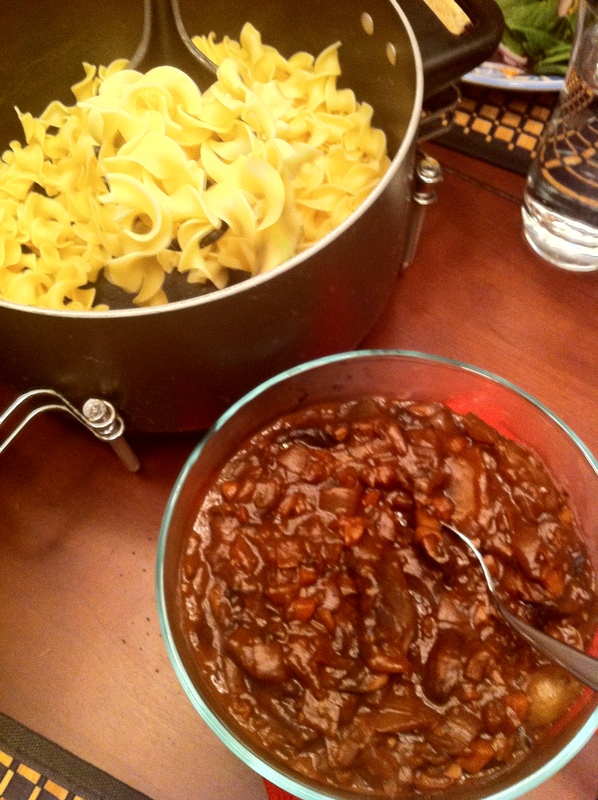 The perfect recipe for the occasion was Deb’s Mushroom Bourguignon. 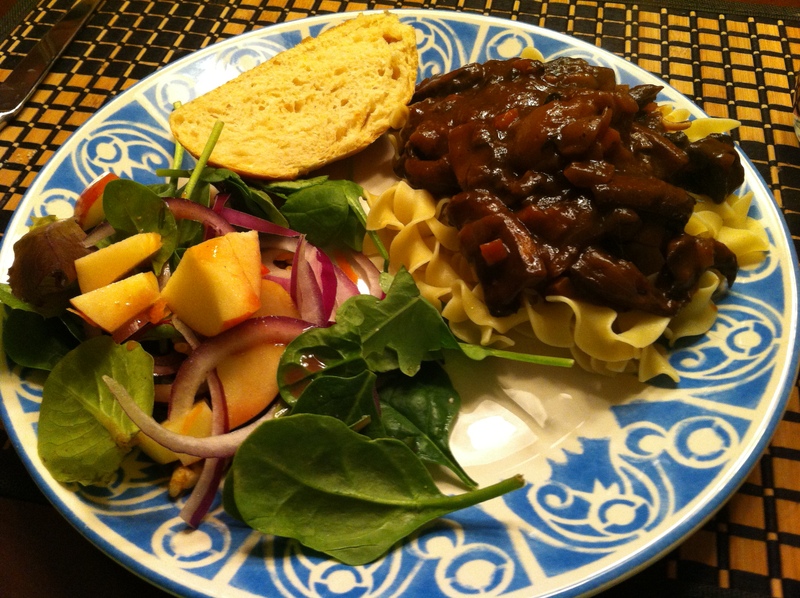 This was perfect because the husband loves the beef version, but it’s vegetarian to accommodate yours truly. It was his favorite dish at the little French bistro near our Baltimore apartment, and he even ordered it in France to follow his snail appetizer. And Julia Child made it. So it better be good. Spoiler alert: it was really good. *Since this was my dinner party main dish, I did all the slicing and dicing ahead of time to save me some time and counter space. So the mushrooms were sliced, onions and carrots diced, and the fresh thyme chopped. All the veggies were put into appropriate containers and stashed in the fridge until I was ready to go. I highly recommend this if you are at all concerned about time or space. And it will make you feel like you are hosting a cooking show with everything prepared ahead of time! 1. Heat 1 Tbsp of the olive oil and 1 Tbsp of the butter in a large saucepan with a heavy bottom on high heat. Add the mushrooms and pearl onions and cook for about 3-4 minutes until they are starting to turn colors. 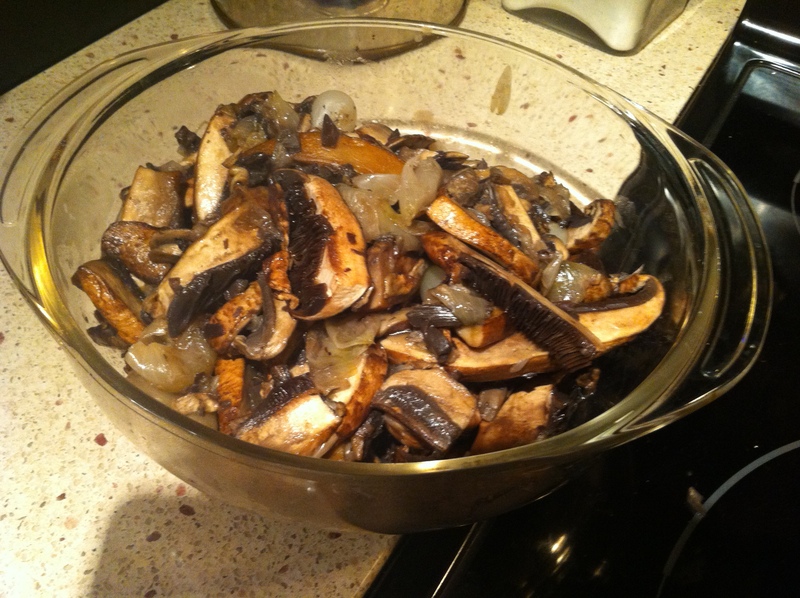 Dump the mushrooms and onions into a separate bowl and set aside. 2. Reduce the heat to medium and add the remaining Tbsp of olive oil. 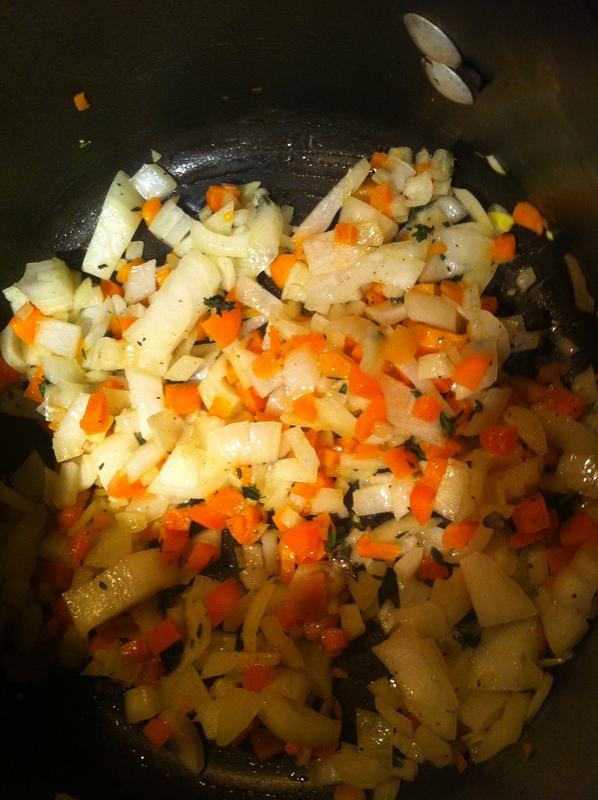 Add the carrots, onion, thyme, salt and pepper and cook for 5 minutes or until the onion is starting to brown. Stir every once in a while as you prepare the next step. 3. Add the garlic and cook for one more minute. Add more salt and pepper. 4. Add the wine and stir well, lifting from the bottom anything that may have started to stick to the pan. Turn the heat all the way up to reduce the liquid by half. This should take about 4-5 minutes. 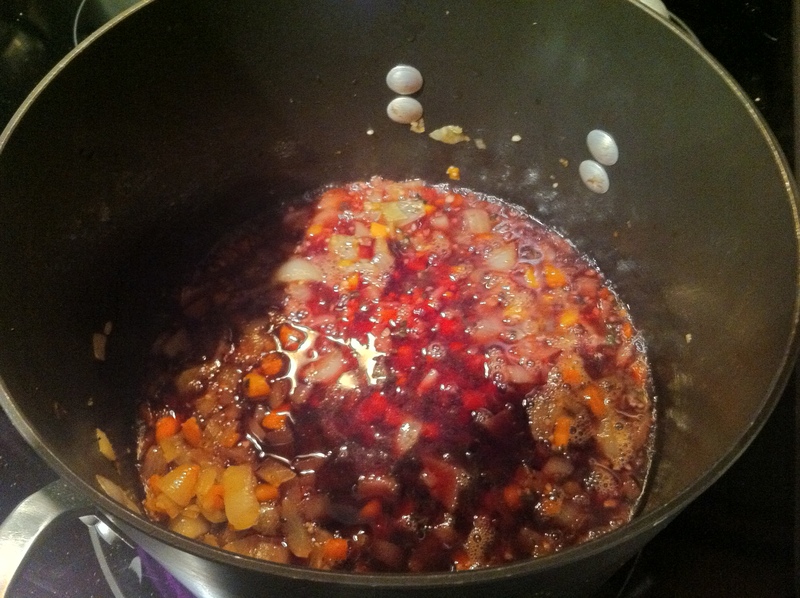 Add the tomato paste and the beef/veggie broth. Dump back in the mushrooms and pearl onions (including any juices they collected while they sat). 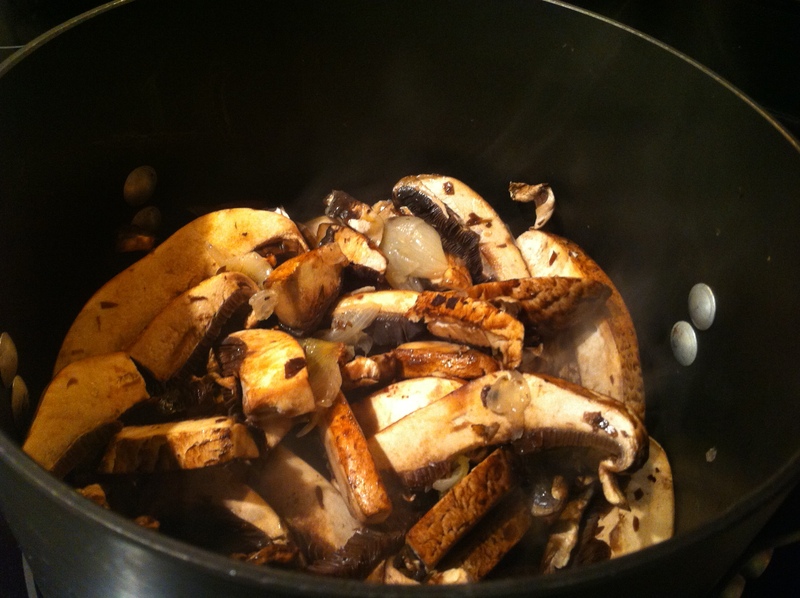 Bring the pot to a boil and reduce heat to just keep the pan simmering for 10-15 minutes. 5. In a small bowl, combine the last Tbsp of butter with the flour. Add this to the stew and season once more. Reduce the heat and cook for 10 more minutes. 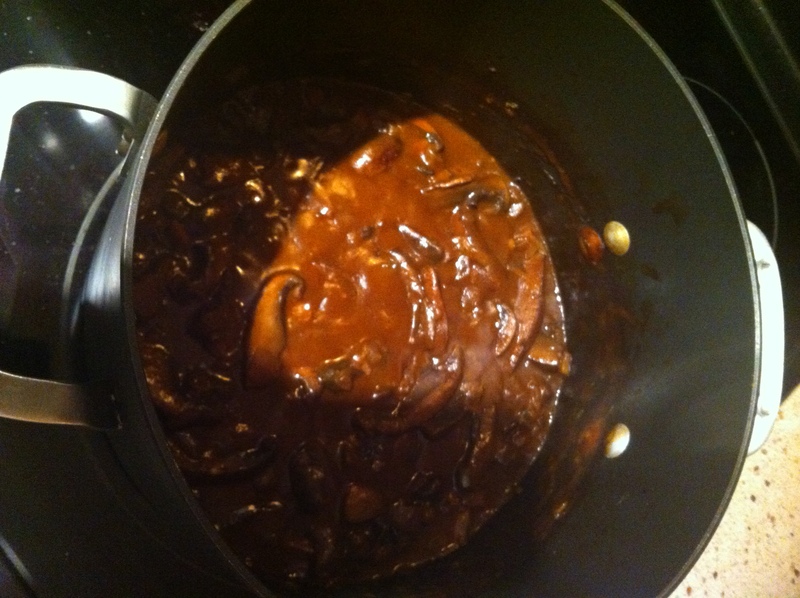 If the sauce is still too thick for your liking, keep cooking it down until it reaches the consistency you like. At this point, the guests arrived and informed us that the good smells started outside the house and led them inside. Our adventurous guests didn’t seem phased that I made a totally new recipe for them, which is supposed to be a no-no when it comes to dinner parties. They instead ate every bit of it and found room for my husband’s freshly baked cookies with a couple scoops of coconut ice cream. Yum! Kudos to my guest photographer, my husband, who kindly took all of these photos while I busily cooked (and tested the wine). Thanks hun! Previous Post Previous post: Pancakes for one, please! Next Post Next post: A wedding, giant stone oven, henna hands, oh my!